Hawk Hill vineyard is situated on the western edge of the Russian River Valley appellation in a very cool site a mere six miles from the Pacific coast, just east of the small village of Freestone. Paul & Vicki Michelczyk planted this southeast facing vineyard in 1994 to both Pinot Noir and Chardonnay. 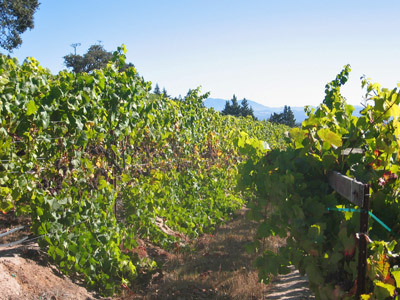 They employ a unique trellising system known as “Scott-Henry”, whereby half the canes of the vine are trained up the trellis and the other half are trained downward to allow maximum light and air exposure to the fruiting zone. In this extremely cool vineyard, these downward trained shoots bring their leaves into close proximity with the soil, which radiates just enough extra heat to keep the vines going when nearby vineyards have defoliated. This briefly extended ripening period helps push the fruit toward perfect ripeness and flavor development. This vineyard produces wines that are an intriguing blend of luscious black fruit typical of the Russian River and the sleek elegance and balance of the best Sonoma Coast Pinot noirs. 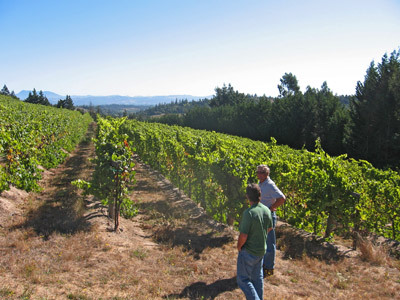 Talisman’s first vintage of Hawk Hill Vineyard designated Pinot Noir was 2005 with a scant 194 cases.